Bobbi Patterson, a longtime Emory administrator and faculty member, joined Emory professionally in 1981. In the decades since, she has held a variety of roles and become, in many ways, “the face of the university,” according to a letter nominating her for the Jefferson Award. In the course of her career with Emory University, Bobbi Patterson has held varied positions and championed initiatives that have touched all parts of the campus. Patterson, a longtime Emory administrator and faculty member, is the 2015 recipient of the Thomas Jefferson Award, which honors a member of the faculty or staff for significant service to the university through personal activities, influence and leadership. 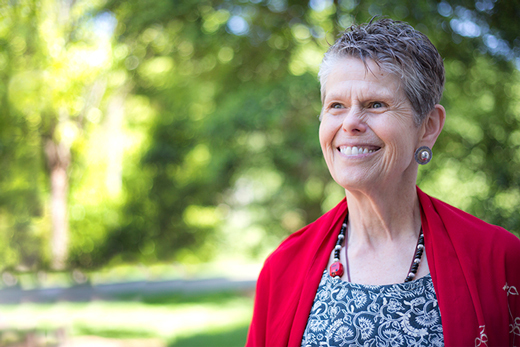 "Her service is longstanding and so wide spanning that it is difficult to think of aspects of the university that she has not touched," wrote Sherryl Goodman, Samuel Candler Dobbs Professor of Psychology and a longtime colleague, in a letter nominating Patterson for the award. "I am fortunate to have had many opportunities to walk across campus with Bobbi and observe how she greets and is greeted by all, from groundspeople and housekeeping staff members to the university president, with numerous students in between," Goodman wrote. "In so many ways, she is the face of the university." But before Patterson became an integral part of the university as an administrator, professor and alumna, she says the thread of her life was already woven into Emory's tapestry. Her father, Lawson H. Bowling Jr., served as clinical director at the former Georgia Mental Health Institute on what is now Emory's Briarcliff property when she was a child, and her brother and husband are both Emory College graduates. Patterson joined Emory professionally in 1981 as associate university chaplain and, in the intervening decades, has served as dean of students, director of the Emory Scholars Program, founder of the Theory-Practice Learning (TPL) Program, a faculty associate of the Office of Sustainability Initiatives, and now professor of pedagogy in the Department of Religion. She earned her PhD in interdisciplinary studies from Emory in 1994. In addition, she served on the task force that led to the creation of the Emory Center for Women and on the Task Force on Dissent, Protest and Community that led to the university's current Open Expression Policy; and chaired the first president's task force on LGBT issues. Through her scholarship on community-partnered learning and service, she founded the TPL Program, which offered workshops, trainings and placement coordination for faculty and community leaders. She has remained engaged in community-partnered teaching and research through Emory's Center for Community Partnerships. Among other programs she has initiated is Emory as Place, a program of the Office of Sustainability Initiatives designed to educate students, staff and faculty about Emory's living systems, built environments, human histories and values. "I feel like I have been very lucky to be part of a place like Emory. I am from Southern people and place is a pretty strong thread of the Southern tapestry," Patterson says. "I began to realize that place-knowing and place-being is an art and a practice that has a strong ethical intention and practice to it. I think it is a skill that is critical in a world where most people won't have the privilege of being in one place for a long time." For Goodman, Patterson "strongly exemplifies the values of Thomas Jefferson." "I am so happy that the committee recognized the qualities that Bobbi exemplifies and the bountiful contributions she has made — and continues to make — to multiple aspects of the university, all of which make her an ideal recipient of the Jefferson Award," Goodman said after Patterson was announced as winner of the award. Gary Hauk, vice president and deputy to the president and an expert on Emory's history, has worked with Patterson in many capacities over the years. "Bobbi Patterson has grown with the university over the past three decades and in many ways has helped to foster the university's maturing self-identity," Hauk wrote in support of Patterson's nomination for the Jefferson Award. "She easily can stand among the ranks of previous Jefferson Award winners — extraordinary faculty members and administrators deemed to have advanced the university and society in positive ways." Both as a graduate of Emory College and as director of sustainability initiatives at Emory, Ciannat Howett says Patterson has had a profound influence on her and on the university. "What Bobbi contributes to the university is a soulfulness and a willingness always to be there when students or the university needs her and to put so much of herself into what she does," Howett says. "She has given so many years and so much to this place to make it a place where you want to be." Patterson says she is humbled to receive the Jefferson Award. "It is an amazing thing and a great joy for me, but it is not possible for a single person to get any award. I have been lucky enough to work with administrators and colleagues who gave me a lot of opportunities and space and power to try things out," she says. "It's just not possible to do it by yourself. I feel completely overwhelmed with gratitude for this place and to be a part of it and to give back to it. And it has borne such fruit."